I was born at Manangatang in November 1926. Because my father was a stationmaster with the Victorian Railways, our family moved all over Victoria. I started school at Mitiamo in 1932. Later, we moved to Balmoral for 9 months, and then to Rochester in 1936, where most of my schooling took place, ending with one year at Echuca Technical College, completing Year 9 in 1941. My parents transferred to Kyabram in November 1941, and I commenced work at the age of 15 at McQueen’s Central Garage (now Hilton’s Electrical at 237 Allan Street) as a motor mechanic in January 1942. My first choice in a job was to be a plumber or electrician, but being wartime, I was fortunate to get started as a mechanic and I earned 1 pound ($2) per week. McQueen’s garage in Kyabram was in charge of the local ambulance and it was my job to clean the ambulance and burn sulphur to fumigate it after an infectious case had been transported. I learnt to drive in an Austin 7 at the age of 15 at Central Garage, and I had my own track out the back, amongst the marshmallows and scotch thistles which were as high as the six-foot iron fence. McQueen’s ran a hire business with a 1936 Ford sedan and I, as an unlicensed driver, did quite a bit of work in this field. At one stage I drove a hire car to Melbourne with a passenger, Mr McQueen by my side (me being unlicensed at 15). McQueen’s also owned the West End Garage (now part of Salter’s panel works). At this garage there were about twenty secondhand cars, and it was my job once a week to turn these cars over with the crank handle. When their mechanic Bill Stanton joined the army, West End Garage was closed down. McQueen’s garage at this time was a protected industry, and as Mr Bill Thomson (proprietor of East End garage), was the only mechanic left in the town, he offered me a job in 1943. It was my second year of working in a garage for the large sum of I pound and 10 shillings ($3) per week. I accepted his offer, but I wasn’t allowed to be employed by him because he wasn’t a protected industry. However, after many visits to Mr Kerwin, the Man Power Officer at the courthouse, I was finally released to work at East End Garage for Mr Thomson in 1943. They then became a protected industry, which allowed them to get oxy acetylene gas and other essential goods. We had to make ammunition boxes with material supplied by the Government. This had to be done after normal working hours (between 5.30 – 7.30pm) with a required number to be made each week. It was also common for me to work on a Saturday and Sunday and not be paid for overtime. I fronted up at the police station to get my license and was told I was too late because the police had already been to the bank. However, Senior Constable Offerman asked me how I had got there, and I replied (sheepishly) that I had driven myself. Without any further questioning he told me to drive him to the bank so that he could deposit my fee for the license, which was 5 shillings (50cents). My license was duly obtained on my birthday at 17 years of age. My actual apprenticeship started at East End garage, 367 Allan Street, Kyabram, in 1943 at age 16 years. During this year, I attended approximately 6 night classes of welding which were held at Echuca Technical College for the Defence forces. Trade schools were non-existent because of the Second World War. I had no further technical training. I received my certificate dated 18th April 1946 which allowed my first year (1942) at McQueen’s Central garage to be included in my apprenticeship. The East End garage was an International Harvester dealer and they also sold the Austin, Vanguard, Rover, and Vauxhaull cars. I worked on cars, trucks, tractors, stationary engines, and farm machinery and kept very busy working long hours from 8 a.m. to 5.30 p.m. or later. There was no overtime paid. I bought my first car, a 1926 Model T Ford utility, in 1944. It had a home made galvanized iron cab. The "drumming" noise from that dulled the rattles in the rest of the vehicle. At the time I had 25 pounds ($50) in the bank and my father was disgusted when he found out that I had paid 20 pounds for it. Dad, being a Railway man and not owning a car himself, said it was a sure way of never having money in the bank as it all went out the exhaust pipe. My parents were only in Kyabram 12 months and had moved on to Ultima when my passion for buying motor cars began in earnest. While I still had the Ford, I bought a 1906 De Dion Buton in 1947 for the large sum of 5 pounds ($10), which I had to put in the Temple Day Appeal at the Church of England as payment. It had been in a garage since the First World War. I got it going the day I towed it home. I used to drive it around the yard at East End but I couldn’t get tyres for it, so I eventually wrecked it. My next car was a Model T Ford that had been used for a fowl nesting spot. I took the white canvas hood and speedometer from the De Dion Buton and put them on the Ford. Some cars which I owned until 1962 were a 1927 Whippet Overland, a 1928 Jewett, a 1926 Oakland 6, a 1934 Ford Tourer, a 1936 Hillman Single Seater, a 1954 Austin A 40, a 1950 and a 52 Vanguard, and a 1951 P4 Rover. I had been a foreman of the workshop at East End garage for 2 years when I decided to have a change in my job and left to work with Repco, spending 3 months in Melbourne and 6 months in Albury N.S.W.. An offer from Bill Thomson to return to East End to my old job was too good to refuse, and I commenced back there as foreman of the workshop where I remained for the next 10 years. By this time, a girl called Enid Hacon had come to live and board with her Aunt in Kyabram. Enid was born in Tongala in 1935 and was brought up on a sheep farm, which is still owned in the family. Enid came to work in Kyabram at the age of 16 at the C.B.C of Sydney, now the NAB Bank. We were married on 27th October 1956 and moved into the house we still live in at Kyabram. I had been employed at East End Garage for 19 years (20 years was long service), when In 1962, I had the opportunity to buy Pitts Motors at 292 Allan Street, Kyabram. With Bill Thomson’s blessing we commenced as “Tobias Motors” on the 6th August 1962. The banks wouldn't lend us any money as we had no security. We had some share investments, but we needed to keep them intact and we were paying off our home. Our first two children, Glen and Bryce, were only 4 and 2 years of age. The purchase price for the good will and plant was 2,500 pounds ($5,000), which we managed to pay, but my brother Ken gave us a loan of 2,000 pounds ($4,000) for working capital to begin business. (We paid him back the full loan of 2,000 pounds within the first year.) We commenced selling Roots Group products, manufacturers of the Hillman and Humber cars. In 1969, we changed to the Datsun, and later the Nissan dealership, and remained with them until we retired. On 8th February 1963, I sat for my Senior Motor Mechanics certificate as an addition to my apprenticeship certificate gained 17 years previously. I employed a mechanic who worked for me for the 32 years I was in business. I always had an apprentice and a person to manage the office and serve petrol, 5 days a week. I opened on Saturday mornings and served petrol, sold parts, and on occasions, serviced a car for students (family clients) home for the weekend. For many years I opened for 2 hours on a Sunday morning to serve petrol as there was no self-service in my day. The business was progressing well and we were able to pay for the freehold ($20,500) on 6th August 1969, seven years after buying the business. In 1977 we bought the house and land next door at 292 Allan Street, Kyabram, with the intention of extending the workshop, but this never eventuated and we rented the house until we sold it in July 2002. From 1982, my son Haydn managed the office for 7 years, and from 1984, son Ross was my apprentice mechanic and worked for me for 5 years. My life was not restricted to keeping vehicles on the road. I operated the spare parts department, sold new and used cars (not my forte I must admit), and was always happiest to be welding or making parts that were not procurable. I worked as a mechanic for 52 years and if there was a complaint from a customer it was fixed immediately. We had very loyal customers who supported us at "Tobias Motors". For the last 4 years Enid was managing the office, until we decided the time had finally arrived to retire and the garage business was sold on 30th June 1994. Over this time, I went from 237 Allan street (1 year), to 367 Allan street (19 years), and my final stop was at 292 Allan Street, Kyabram, for 32 years. My journey in mechanics has been very rewarding, and I am happy and blessed to still continue to enjoy my hours of restoring cars in retirement. In 1973 a wrecked Chevrolet van was donated to the Kyabram Historical Society. It was lying in a hay shed four miles out of Kyabram. I paid the Society $50, and told them I would restore the van for the Society and that it should remain in Kyabram. Later on, there were many times I regretted my promise as I had a motor garage to run and family commitments. The van has had only one owner, William Gee, a Chinese Market Gardener. Willie, as he was fondly known, drove it into town daily with his vegetables and sold them from the van in the main street. I had worked on the Chevrolet many times when I was an apprenticed motor mechanic at East End Garage. Money and enthusiasm was in short supply and it stayed stationery down in my back yard for a few years. In 1976 Kyabram was to celebrate it's centenary. This was the incentive to begin restoration, starting from the chassis. The woodwork was completed, and I got it to the stage where I towed it with the 1925 Dodge in the centenary float parade down the main street in Kyabram and to the football oval. Enthusiasm waned again. In 1994 when we retired from the garage, the Chevy was to be the first job to complete, but alas another 4 years went by, although I had been gathering necessary bits and pieces such as valance panels, speedometer, bonnet, shackles etc. In 1998 with a lot of pressure to get it completed, the seat was upholstered, hood and roll up sides made, and painting done. It was now looking more like the end of years and years of start and stop restoration. In the last burst of energy I had it completed ready for our car club Christmas break up in December 2000, at which I was awarded a trophy for "best individual effort." This was with great satisfaction after spending about 400 hours labour, and $3,500 in material and parts. "What a labour of love." I had travelled all over Australia and overseas in search of parts and found the headlight surrounds in America. The van is housed in the "Transport through Time" shed at the Kyabram Fauna Park. In 1967 I heard that some young men had acquired the 1925 Dodge Tourer owned by Kyabram and district identity Mr George Rathbone. Their intention was to cut it down to make it a fox hunting vehicle. To me this would have been a disaster and the car would have been lost forever. I quickly made contact and negotiated a sale for the Dodge of $100 on 17th April 1967, and towed the vehicle to my workshop. Mr Rathbone bought the car new for 395 pounds (approx $800) and drove the car until he was 90 years of age. The Registration number 71773 was cancelled on 18th May 1964. Mr Rathbone knew that I was restoring the Dodge but unfortunately he passed away, aged 95 years, 3 months before I completed the restoration. Restoration started almost immediately in the workshop with 62,450 miles on the speedo. Every spare moment was spent by me on the Dodge. Rings fitted, valves ground, all engine bearings adjusted, new bearings fitted to the gearbox, differential, and wheels, etc. The body was stripped and painted to original colour, the wooden spoked wheels tightened and stripped of grey paint, and painted in clear varnish. This was all completed in time for it's first outing to the Echuca steam and vintage rally in June 1968. In1987, a new hood and side curtains were made and fitted, and the seats re-upholstered. In 1997 at 72,678 miles, the motor was removed and a complete overhaul carried out. New pistons, rings, and bearings were fitted. The crank shaft and camshaft ground, and new valves, etc. The Dodge has taken us on many rallies, covering over 20,000 miles, and is still performing well with 82,534 miles on the speedometer in 2011. Frank’s comprehensive collection totals just over 3,000 plugs. This represents about 700 brand names. He has a surplus of over 900 plugs. Since the spark plug was invented, there has been approximately 6,000 brand names manufactured but this changes as new plugs appear – not seen or heard of before. There is a strong collector group in the United States called “Spark plug collectors of America” (S.P.C.O.A), of which he is a member and regularly obtains the updated Master Plug List. The club currently has over 700 members worldwide. The average spark plug consists of three main parts – a steel or brass plug body, a central metal stem, one end of which forms a threaded terminal and the other end an electrode, and some insulating material to keep the two metal parts separated. However, like many other products, manufacturers have tried all sorts of variations on a theme, some of which has enhanced the performance of sparking plugs and others which have been mainly sales gimmicks. The only real advance in spark plug technology over the last century has been to develop ways to make them cheaper and more reliable so they last longer. The basic spark plug has to withstand 20,000 to 60,000 volts. It has to endure temperatures of up to 2,500 degrees centigrade, and only 3 inches away at the terminal end, it can be stone cold. It has to withstand pressures of up to 800 pounds per square inch and a combination of all these things occurs continuously, e.g. a four stroke engine traveling at 40 mph, each spark plug fires approximately 60,000 times an hour. The spark plug has to withstand sudden changes in temperature, from the heat of the power stroke, to the in-rushing cool fuel air on the inlet stroke, and the chemical reaction on the spark plug. The first patent for spark plugs was issued in 1860 to a Belgium man named Jean Joseph Lenior, and they were produced by him in France in 1897. They had to produce a magneto capable of firing the spark plug. 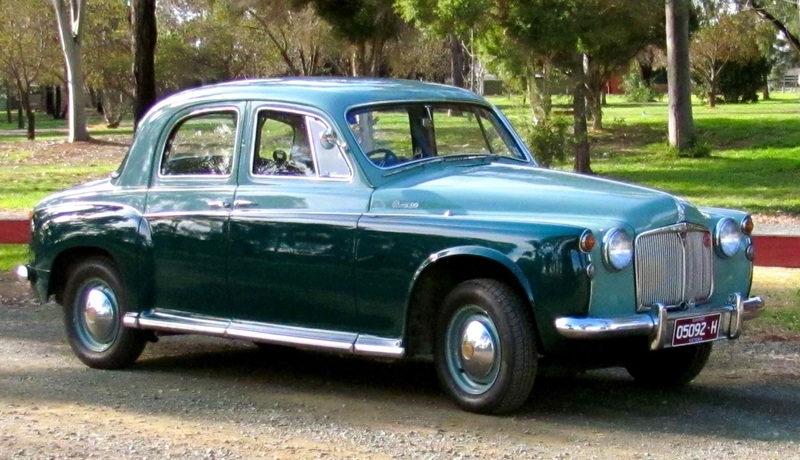 Resides: Kyabram Dream car: 1955 Silver Cloud Rolls Royce. Family: Married to Enid with four sons and five grandchildren. Expertise: Frank will provide expert advice, especially on older vintage vehicles and act as a mentor if required for genuine car enthusiasts. 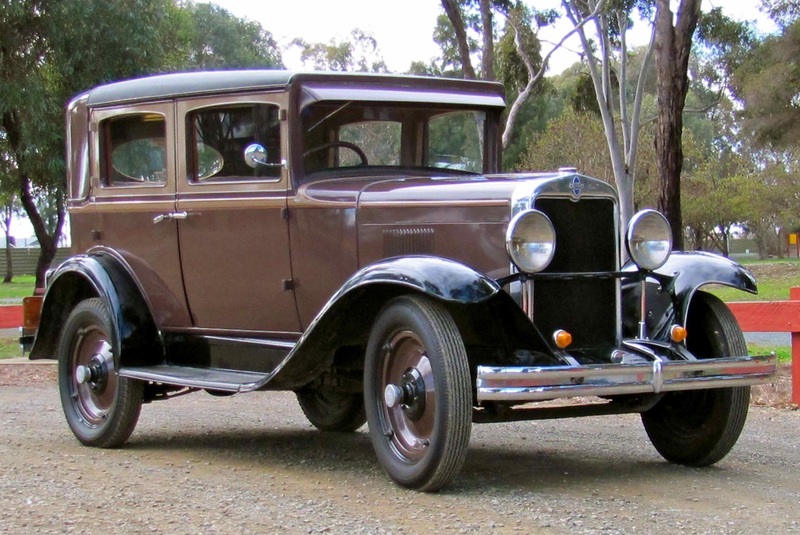 Currently owns and drives: 1925 Dodge Tourer, 1927 Chevrolet van, 1929 Chevrolet sedan, 1954 Rover P4 90 & 1958 Rover P4 90 series, 1964 EH Holden sedan. Also Frank has 20 restored stationary engines in working order and has 7 showcases of memorabilia. Interests: Restoring vintage and veteran cars and collecting spark plugs from around the world. Membership: Member of the Vintage Drivers’ Club,Goulburn Valley Motor Vehicle Drivers Club, Kyabram Vintage Engine and Machinery Restoration Group. Member of the Dodge Brothers Club Australasia, Rover P4 Drivers Guild. Over 30 years a member of the Kyabram Historical Society. Note: I met Frank and Enid in 2011 for this interview in Kyabram, Victoria.